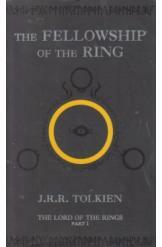 The Fellowship of the Ring by JRR Tolkien, Sci Fi. Book is in good condition, all pages intact. The magic ring that Frodo Baggins recieved from his father is found to be an ancient and terrible weapon of the dark lord Sauron. Guided by the wizard Gandalf, a group of companions assemble to bring Frodo on a quest across Middle Earth to destroy the Ring. Book one of "The Lord of the Rings" series.